A couple of years ago (has it been that long?) I participated in an arts workshop called Fieldwork here in Houston via CORE dance. The work (not the focus of this article but something I’d invite you to learn more about) culminates in a final presentation. For this particular program’s physical program we were asked to include a bio… in haiku form! It felt like “my story”…incorporating a sense of movement, of personal growth, of my diversified career/interests/talents, and my then new role as a mom. Recently, in an email conversation, I traded “stories” (dance backgrounds, life and training pathways) with a young ballet dancer, who you’ll be hearing from later this week on Dance Advantage. I am more than twice her age (ugh!) but in a few paragraphs we were each able to summarize and hit the highlights of our experience. It was like exchanging bios but more personal, revealing something more of ourselves – character, qualities, aspirations. I began to think about autobiography and that all of us have an interesting and very individual story to tell (even if it wouldn’t or shouldn’t take a novel to tell it). I discovered in the process that her story: the things she’s accomplished, experienced, and done, are compelling not because they are uniquely spectacular but unique to her, interpreted by her, shared by her. Whether you elect to focus your tale on dance or on your entire life’s journey, I’d simply like to invite your to share your ‘autobiography’ with the rest of us in a medium of your choice. As I mentioned, the Haiku form was fun to revisit. This option may be right for you if you’d like the mental or artistic challenge of summing up your story in just a few words, if you’d like to avoid getting too specific in a public space, or if you’re short on time but can handle something in short form. The way you share can be as unique as your story, however. 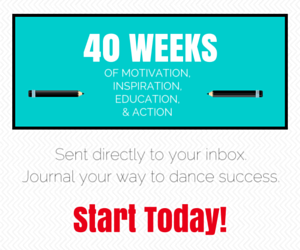 Can you dance/improvise your story and get it on video? Can you write out some prose in a few paragraphs? Can you paint or draw your story? Feel free to be creative with your response! When you’re ready to share your story, place it or link to it in the comments of this post. Or, if you prefer, send it to me via Twitter @danceadvantage or put it on our Facebook page wall. Why not? I know you’re busy. Me too. There’s no pressure, twist-your-arm incentives, or time limits. I really just thought “Wouldn’t it be interesting to hear/read/see the stories of our readers?” and decided to offer a way to share them that is creative but not necessarily time consuming …for fun! What will you highlight? What will we discover about each other? Not to get all kumbaya on you, but you might call it a creative community-building exercise. Make it part of your dance journal, if you like. I hope you’ll give it a try. Don’t leave my Haiku hangin’! While thinking about your story, take a moment to reflect on how dance and the arts have been critical along your path. I know they’ve played an enormous and crucial role in my story. If your reflection moves you, visit the Americans for the Arts website and find out ways to take action today and in the future. You’re pregnant? How did I miss this? Congratulations! This challenge is perfect for April since it’s National Poetry month. Bonus! Thanks Tiffany 🙂 I hope you’ll get your Haiku on and share it with us! Feel free to pass it on to blogger friends, too – the more the merrier. They don’t need to link back unless they want to but all are welcome to put a link to their post right here in the comments. Thanks Kerry! I’d love for you to participate! First of all, congratulations to you on your second baby! Hope it’s a smooth pregnancy. Beautiful, Leigh! Thanks SO MUCH!